"So I know you finished the investigation… I'd like to know what you plan to do…" Cinedigm has released an official trailer for an indie thriller titled River Runs Red, from writer/director Wes Miller. The crime drama is about a successful judge whose son is killed by two police officers, and the system sets them free. While a hardened detective works to find incriminating evidence from the officers, the judge teams up with another grieving father to take the law into his own hands and go after the officers. Starring Taye Diggs, with John Cusack as the detective. The film's cast includes George Lopez, Luke Hemsworth, Gianni Capaldi, Briana Evigan, RJ Mitte, Steven Berrebi, Jaqueline Fleming, and Jennifer Tao. This is one of those trailers that pretty much shows the entire film, so watch out, because there's not much to show. 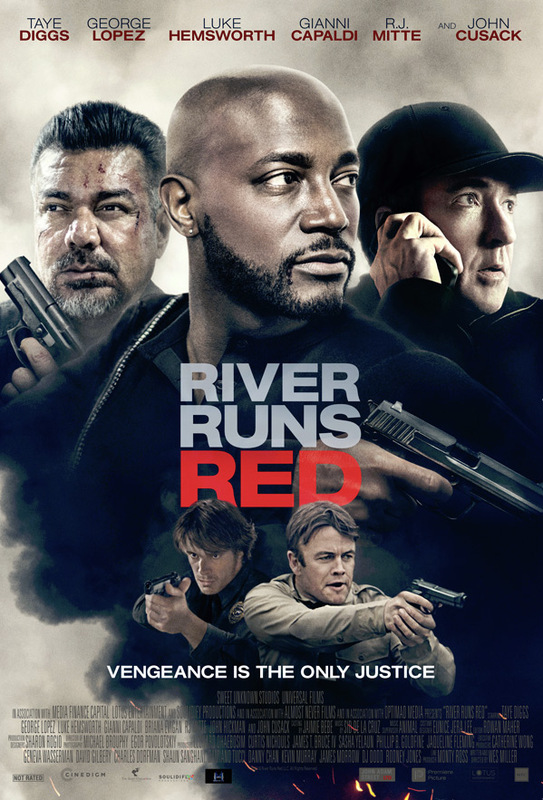 River Runs Red follows respected Judge Charles Coleman (Taye Diggs), who has devoted his life to law enforcement. When his son is shot bt two police officers in a traffic stop gone awry, Coleman turns to his long-time friend, Detective Horace (John Cusack), and discovers an unchecked pattern of violence with these same cops. Betrayed by the system he swore to uphold, Coleman joins forces with another bereaved father (George Lopez), and the two men take the law into their own hands. River Runs Red is both written and directed by American filmmaker Wes Miller, director of the films Lily Grace: A Witch Story, Prayer Never Fails, and Atone previously, as well as a few shorts. The film hasn't premiered at any film festivals. Cinedigm will release Miller's River Runs Red in select theaters + on VOD starting November 9th this fall.